There have been quite a few Origin related Kickstarters over recent months that should be delivering the finished goodies imminently. One that arrived a few weeks back was the latest Wing Commander CD from Wing Commander 3-5 composer George Oldziey. His original CD was a full orchestral recording of some of his Wing Commander music and very good it was too. This latest one is a more modest jazz interpretation of some of the Wing Commander themes recorded with his Latin jazz band for the first half of the album, along with some more conventionally re-orchestrated versions (recorded on a high end synthesizer) in the second half. I wasn’t sure the world was ready for jazzed up versions of Wing Commander music but I was clearly always going to back the campaign. The CD starts with a swinging version of the Kilrathi theme music. Listening to such a familiar tune altered like this does bring the disco version of the Star Wars theme to mind and I’ll confess to finding the whole notion a little amusing. It really shouldn’t work but somehow does, it’s actually not bad at all. The other jazz tracks center around the Wing 3 bar music which is a more obvious target for a jazz group and it all fits quite nicely. The re-orchestrated tracks are more up my street if I’m honest all sounding much better than the original recordings. The Wing Commander 3 & 4 music is some of the best of the era. Chris Roberts should have got George to write the music for the movie if you ask me – I might have liked it a bit more. I can’t see me listening to this all that often but it’s certainly a bit of fun and George has delivered everything he promised once again. I’m very much looking forward to backing the next one if there is one. It’s been over a year since the last one so it’s time for another of my semi-regular looks at the hoard of gaming stuff I’m storing round here. I’ve been actively collecting for something like 20 years now but the oldest bits date back to when I first bought them around the end of the 80’s. I’ll keep it shortish as there aren’t massive changes to the last time. The main difference is that I’ve replaced all the bookcases holding the big boxes for much larger and smarter Ikea equivalents. Other than that I’ve added a good few big box games, and a whole lot of PC Zones in my efforts to get them all scanned. The big boxes are in what would probably be a dining room in a more normal house but I’ve dedicated it to PC gaming (plus the occasional bit of work). Starting on the left, I’ve got a load of posters and a repro Crusader standee on the wall with the radiator. The glass desk is an oddity I’ve had since early 2000’s where someone had the bright idea of putting the CRT monitor underneath so that it doesn’t take up all your desk space. It’s great for that purpose but I really should get something a bit bigger one of these days for my main PC. Onto the big boxes. I still haven’t organised them particularly well but they are loosely clumped by company or theme. It has on occasion taken me 10 minutes to find something when I can’t remember what the side of the box looked like. Most of the Origin stuff is in that first bookcase. There are Star Trek, Infocom, Access, Westwood and SCI clumps in the other cases. Next is Sierra corner with everything AGI and SCI. After that, it’s Lucasarts, guide books too big to fit into their boxes, FPS’s and Legend adventure games. The final case is extremely random, a little bit of an Interplay theme going on but it’s basically everything else. I may thin some of this out this year of the bits I’m not too worried about. On to the upstairs, the box room is currently storing all the old PC magazines. These are way better organised than the games and all in chronological order – if they weren’t I would never be able to find anything. The PC Zone coverdisks are neatly stored here in order as of about a week ago when I plugged all the gaps in the archive. The drawers on the right are largely full of Origin design docs most of which I’ve shared on this site over the years. Finally up another floor to the attic room which is where all the consoles and computers go. The stairway up has all the really big Origin posters that I can’t fit anywhere else. I’ve a few old books and the like shoved in the first corner. I expect my guide books may end up in here before much longer. Going round, most of my old systems are plugged into the B&O TV in the corner via an impenetrable nest of SCART switches and cables. I don’t especially collect games for any of these systems relying largely on multi-carts instead but I have added a load of Ultimate – Play The Game boxes this last year. My old TV from student days is on the right which is a bit more basic than the B&O. I’ve found that not all the systems will work on the B&O for whatever reason. The picture on the C128 is fairly patchy also and may end up moving to this corner in the foreseeable future. My favourite bit up here is the collection of old PC’s with a IIGS, Tandy 1000 TX, FM Towns 2, 286 (set up for composite CGA) and the Amstrad CPC at the end. You may spot that the monitors don’t actually match the machine they are sat on (for space reasons). The IIGS actually outputs to the TV in the corner. The rest of the magazine cover disks are nestled in an alcove on the right in a slightly disheveled state having extracted all the PC Zone disks the other week. I’ve got the heart of the tiger up here at the moment. He was supposed to go on the wall downstairs but is too wide to actually fit. I could move all the pictures around if I was keen enough but for now he lives up here next to the Vectrex and spare controllers. That’s the lot. The collection isn’t likely to grow a whole lot bigger from here on out. I’d like to keep the rest of the house relatively normal and two games rooms is kind of excessive as it is. I’d rather enjoy what I’ve got at this point and most of these systems haven’t seen anywhere near enough use as it is. There is always room for a few more big boxes though and maybe a 386/486 this next year. The time has come to play Shroud Of The Avatar at last, the first new Lord British game I’ll have played since Ultima 9 back in 1999. There haven’t exactly been many others to choose from in the intervening 20 years and none whatsoever offering a single player experience. Around a quarter of that time been spent building up to Shroud and in my case the excitement of the Kickstarter wore off some years back if I’m honest. I’ve deliberately not followed the development whatsoever so I could play the game without any foreknowledge but I’ve certainly heard enough negativity to be apprehensive now it comes round to actually playing it. In truth, I’ve never been overly optimistic about Shroud from the beginning. The obvious concern was the fact that Richard hadn’t produced a truly successful single player game since Ultima 7 way back in the early 90’s or any single player game at all since the late 90’s. Developing games is clearly going to be a different beast these days and we’ve seen plenty of other developers from that era flounder with far less ambitious titles. Speaking of which, the joint online/single player experience seemed wildly ambitious for the budget. In terms of the games actually produced by 90’s era developers via Kickstarter, the ones I’ve enjoyed the most have been those that have been unashamedly retro in their nature. Games like Thimbleweed Park prove how successful that can be. I also loved Tesla Effect, a game which was pure fan service and being one of those fans I was all for this. I would have been perfectly fine if Shroud had used Ultima 7-like technology so the major effort could go into the story, dialog and world. My first view of what was at the time being bandied about as “Ultimate-RPG” was during my trip to Austin some years back where I was fortunate enough to get a look around the Portalarium offices. This was before Shroud was announced and Portalarium were building up to their big RPG game via several smaller releases. The way I remember it at the time, Richard said he was keen to do something away from the fantasy genre having spent years with Ultima and there was indeed an array of sci-fi concept art for the game on the the wall of the meeting room. I was definitely surprised when about 8 months later Shroud was announced as it was a major departure from what had been in the offing some months back. While there was always going to be a cloth map, Richard had been adamant months prior about not producing a boxed version since no one wanted them any more. Being partial to a big box myself, I argued the case with him but wasn’t swaying his opinion. Ultimately we did get a big box so something clearly changed his mind, with a cloth map and physical manuals including a look back at one of his old notebooks. It’s a really nice package and whatever people may think of the game, at least the packaging is appropriate. So many Kickstarters have failed to deliver on physical rewards that I’m reluctant to back many of them any more. The aforementioned Tesla Effect is a prime example. As for what it’s like to play Shroud, I’m about 8 hours in which is far enough to offer a first opinion at least. To be blunt, I’m not enjoying it all that much, to the extent that I’m questioning whether it’s worth sticking with. I’m not going to say that it’s terrible, rather the experience has been insipid and uninspiring. Playing the single player offline mode, it reminds me a lot of Ultima 9 minus the excellent dungeons, music and detailed world. It’s not all bad, the world is certainly large enough from what I’ve seen and the graphics while dated can still make an impression at some of the more sweeping vistas. I’ve “borrowed” a couple of screenshots from the Shroud forums – the game certainly isn’t as ugly as some people would have you believe. I would say is that the world has been much less interesting to explore than Ultima 9 with no real rewards for searching around the map and lots of empty spaces. The trappings of this being an online game are readily evident playing in offline mode. Rows of giant empty houses with for sale signs fill up every town. Every time I return to a map, the same monsters are in the same locations and you can even see them pop into existence again in these spots if you wait around for a while. The storyline and dialog is probably what is holding me back from enjoying Shroud more than anything else. The dialog system is basically a combination of Ultima 4 and 6 with selectable keywords but also the option to type in anything you like. This is a decent enough choice even if the presentation here is sub-U6 given the lack of character portraits. The trouble is most of these characters have no character. Every NPC will spout reams of similar dialog, precious little of which holds any interest. The quests they will give you are the usual fetch this, kill that fare. The people you met in Ultima games were usually bursting with personality but it’s simply not been the case here. The game world appears to be far too large for it’s own good, given the size of the team working on this. I’m less than clear on where the overall plot is heading. It hasn’t gone much beyond a load of apparently evil elves attacking everyone else for no clear reason and I’m supposed to fix it all somehow. I’ve spent the majority of my time simply building up lists of quests and then heading to the arrows on my map to complete them. This is exactly the sort of thing that wasn’t supposed to happen in Shroud the way I recall. Said quests are frequently bugged and I’ve been unable to complete several of them having fetched whatever item someone wants and then being unable to give it to them. I’m not giving up on it yet. There are hints of Ultima particularly in the shape of an Oracle that I’ve talked to a couple of times who will tell me how I’m doing in terms of virtue. I can’t say I’ve seen many chances to obviously affect these values yet and imagine it will be expanded upon later. I do get the impression that there is depth to the world but that it’s not being presented to the player particularly well. Maybe going in cold wasn’t the best idea after all but I’ll be persevering in the hopes that Shroud will grow on me eventually. It has to be said that were it anyone else’s game, I probably would have given up by now but I’ll put in some more hours before I offer a full opinion. There has been a glaring Apple Macintosh shaped hole in my collection for years now. I’ve always been put off taking the plunge by the ever dwindling amount of space, coupled with my complete lack of knowledge of everything Macintosh. The latest Ebay voucher proved too tempting though so I’m starting the new year with a new toy, an Apple iBook G3. This thing would have cost around $1500 back in 2001 (price being a large factor in my Apple dislike), but to be fair it’s holding up remarkably well after all these years so maybe that price tag was somewhat justified. With a clock speed of 500 Mhz, it’s a bit more modern than I strictly needed but the price was right. This particular model has a bonus in the form of 2 USB ports, the plan here being that I won’t have to track down ADB joysticks, mice, etc and can instead plug in hardware I already have. 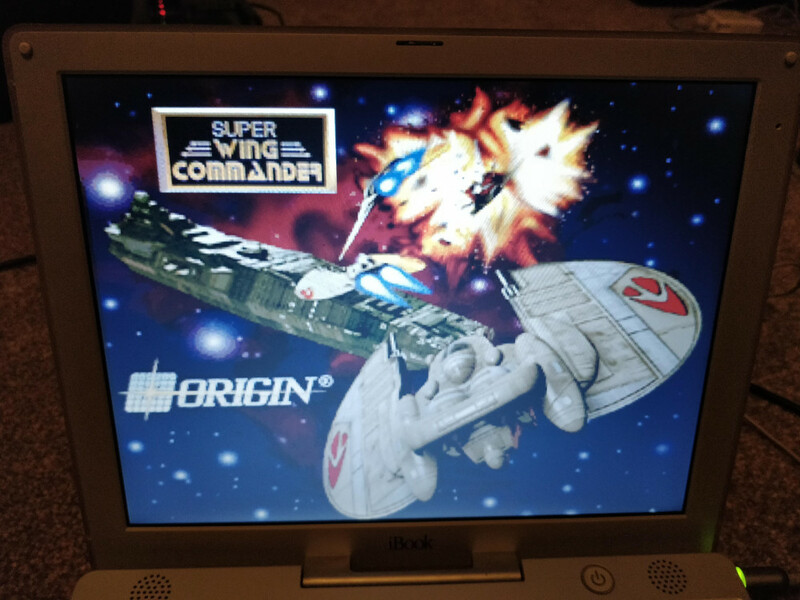 The first games I wanted to get working were of course Macintosh specific Origin titles in the shape of Super Wing Commander (otherwise only available on the 3DO), and Lairware’s extremely nice looking Ultima 3 port which I’ve wanted to try ever since first seeing screenshots of it a decade or two back. Before I have a proper look at either of them, I thought I’d do a short post on what was involved in getting the machine set up. First off, you’ll need somewhere to download the software from. There are several sites to choose from and I went with http://macintoshrepository.org for no particular reason other than topping the list in Google. The first job was downgrading my Macintosh operating system. 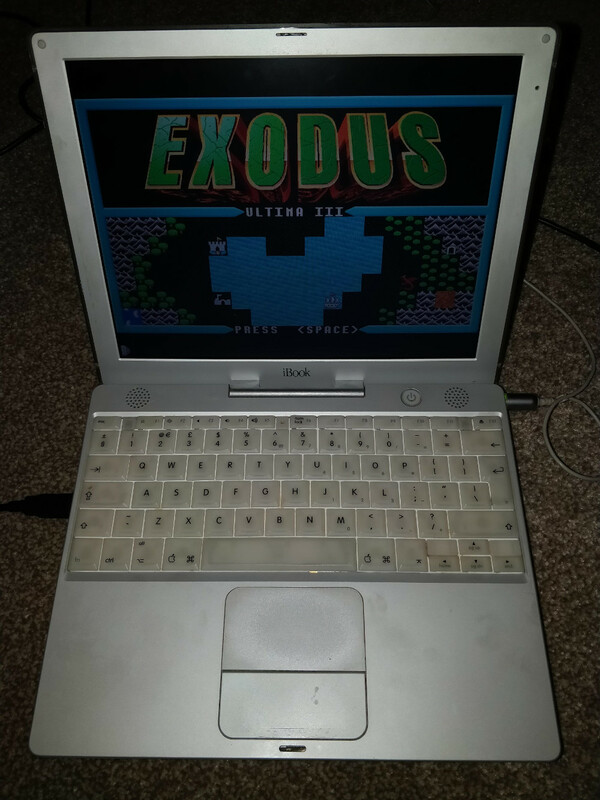 The sweet spot for running old games appears to be MAC OS 9, this laptop came with 10 installed but would have originally run OS9 when new. I downloaded 9.2.1, burned it to a CD which you have to boot to and then install everything to the hard disk. The process is quick and simple – installation takes about 5-10 minutes. I did originally try OS9.1 but it refused to boot up and apparently didn’t support my particular hardware (predating it slightly). I started with Super Wing Commander which was absolutely flying by at entirely uncontrollable speeds when first installed. I was wondering if I’d bought the wrong machine at this point. I tried various slow down tools with some degree of success but in the end, I’m not using any of them. When first installing the game from CD, you are given a menu of options one of which includes whether to use Apple Quickdraw for displaying the graphics. When selecting the slowest, most compatible option the game ran straight out of the box at the right speed, no CPU throttling required. Getting it working with a joystick was trickier. I’ve got an old Saitek X52 Pro which wasn’t working in the game without the addition of a tool called “USB Overdrive”. Once installed, this allows you to map controls to the joystick axis and assign keyboard presses to the buttons. It’s clunky but appears to work correctly once you go through mapping everything. My only real complaint with the 3DO version of the game was that it didn’t have true analog controls, instead having a small number of movement bands as preset speeds. I was hoping this wouldn’t be replicated on the Macintosh but unfortunately it appears that it is. The game is running well at 640×480 resolution anyway and I’m looking forward to revisiting it. If Ultima is more your bag, then I can happily say that Lairware Ultima 3 ran correctly without any tinkering being required. It was a similar story for Wing Commander 3 and 4 which might actually run a little smoother than their PC equivalents. Super Wing Commander has proved to be the exception rather than the rule with just about everything else I’ve thrown at this running straight off the bat. That’s basically all there was to it. I’ve done a couple of these fixing up old machines posts before now but this has to be the shortest. The Mac is modern enough to make life simple so maybe all those Apple fans did know something after all. The battery on my laptop is all but useless after all these years – a replacement on Ebay was all of £10 so that is already in the post. The Mac also uses a proprietary port for a monitor connection and would originally have come with a VGA cable to convert it into something people couple actually use. I’ve got my eye on an auction for a cable that I think will work but Apple being Apple, they have used a whole range of proprietary display connectors over the years so I won’t know for sure until I try it. A regular PC USB Keyboard/Mouse will indeed just plug straight in and work without any grief. I’ll look at hooking this up to a CRT with a proper keyboard and mouse when I have the required cable. Even without that I can see myself using this a ton as a portable gaming rig when I get the battery sorted out. A lot of my old DOS and Win 95/98 favourites made it onto the Macintosh and I’m really curious to have a look at some of them again in this format. 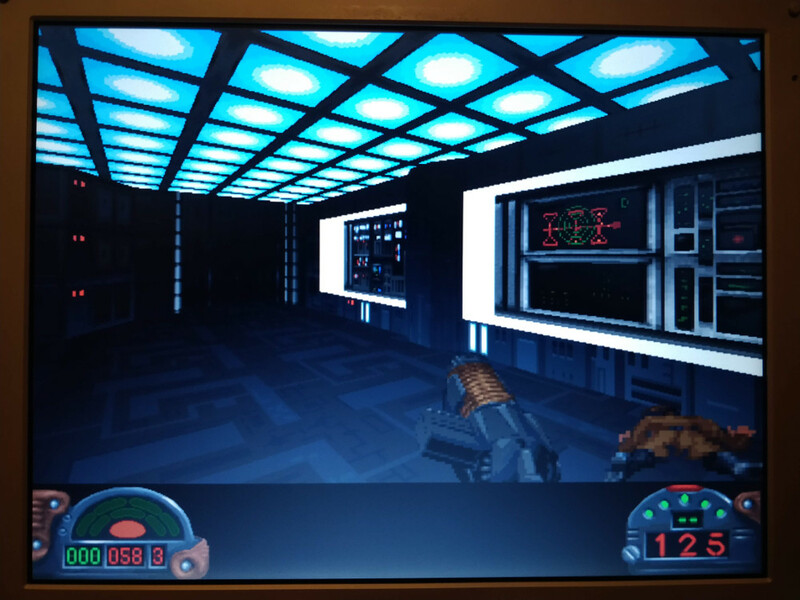 A number of DOS games were improved for this platform. For instance, I tried Dark Forces which runs in 640×480 here on the Mac and Prince of Persia has spruced up cartoon graphics. It isn’t all good though. I have a number of games on dual format Windows/Mac CD’s. One of these is the excellent adventure game The Dark Eye which was always a little tricky to run on PC. That is actually worse here as it apparently won’t run correctly on anything except System 7. I expect some of the really early Mac games may cause problems also but for the most part everything I’ve tried has run fine without any tinkering being required. It’s early days but using a Mac for the first time has been something of a revelation. Setting this up was way, way easier than an equivalent Windows 98/DOS dual boot machine and copying software to it a piece of cake using either burned CD’s or a USB stick. Given that 486’s and Pentiums are reaching a point (in the UK at least) where the price of entry is getting fairly stupid, a Macintosh may actually be a good route of entry to gaming of this era. It can cover both DOS and the Windows era and G3’s are readily available at very low prices. Of course, plenty of games didn’t make it over to the Mac so it’s not perfect but there are some exclusives to the platform making up for it. The bottom line is I should have bought one of these years back. I’ll be taking a proper look at all the Mac ports of Origin games in due course so expect some playthroughs on here sooner or later. It’s about time I gave Shroud Of The Avatar a go however so that may be first.